Setting weight loss goals is probably one of the more difficult steps of a weight loss program. How much do you need to lose and how do you calculate that number? The way most of us approach it is to choose a number based on what we used to weigh or, perhaps, what we've always wanted to weigh, but is that a realistic goal? If you're losing weight for your health, your goal might be more modest, say 5 to 10 percent of your current weight. But what if you have something more specific in mind like a certain clothing size you want to fit into? The problem is, there isn't really a set weight that equates to a clothing size and, for women, clothing sizes differ from company to company. So, what's the answer to all of these questions? Your first step is to learn how to set reachable weight loss goals that you can actually measure. The key to setting weight loss goals is to follow the standard of goal setting, which means it neest to be SMART. A smart goal is: Specific, measurable, attainable, realistic and tangible. Go all the way back to the basics and start by figuring out if you really need to lose weight. If you talk to most people, you'll probably find that everyone feels like they need to lose weight, even people who appear to be at a healthy weight. Of course, those aren't the only clues that tell us we need to lose weight. There are those annoying indications like tight clothes, getting out of breath doing simple activities, or stepping on a scale for the first time in awhile. However, before you set goals based on what you think you should weigh, talk to your doctor. He or she will usually have access to height-weight charts or other resources that can help you figure out a healthy weight range for your body type. If you've determined you do need to lose weight, your next step is to set a reasonable weight loss goal for yourself. You can base your goals on any number of factors, but a great place to start would be the general recommendations set out by the American College of Sports Medicine which are 5-10% of body weight or one to two pounds per week. This weight loss calculator will help you set a daily calorie target to best achieve your weight loss goals. Your results will help you focus less on a target weight and more on making healthy choices each day to reduce your calories. The daily calorie goal from the calculator above is the number of calories you should eat every day to reach your desired weight in the time frame you set. This created your calorie deficit (with diet and exercise) and your body will respond to that over time. Eventually, you'll get to a weight you can sustain and feel good about. Mary is 5'7" tall and weighs 160 pounds. Her BMI is 25.1, which falls into the 'overweight' category. If she lost just 10 pounds, her BMI would be healthier at 23.5. Mary's goal is to lose 10 pounds in 12 weeks. To do that she would need to cut or exercise off 300 to 500 calories each day. Using a combination of diet and exercise is the best way to lose weight since dieting alone can cause you to lose muscle mass. Muscle mass is more metabolically active than fat, so you want to keep all the muscle you have and add more with strength training. Replace her morning Egg McMuffin (300 calories) with a bowl of oatmeal (about 180 calories). Replace one Coke (150 calories) with sparkling water (0 calories). Walk for at least 30 minutes at 3.5-4.0 mph, three days a week (approx. 180-240 calories burned). With this plan, she will burn a total of 270-550 calories each day (depending on whether she exercises). Looking at this example, you can see that these are fairly modest changes. Mary isn't revamping her entire diet, she's simply picking a few things she can change to get started. 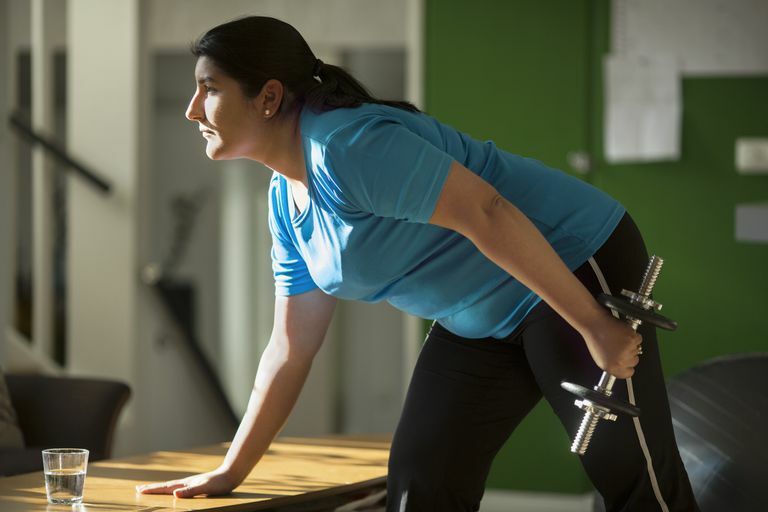 What's interesting is that, as she continues with her healthy behaviors she'll start to do even more, not just because she wants to lose weight but because she's going to start feeling better, stronger, more confident. Try breaking down your goal into specific steps like this and track your progress. Just remember to adjust your goal whenever you need to. If you find you're not losing weight as quickly as you thought (and this is very normal), change your goal weight or the length of time to reach it. Remember, your goal needs to be attainable, so be willing to set new goals if the old ones aren't working for you. ACE Fit | Fitness Facts | A SMART Guide to Goal Setting. ACE Fit | Fitness Information. https://www.acefitness.org/acefit/fitness-fact-article/3575/a-smart-guide-to-goal-setting/. Forman EM, Butryn ML, Hoffman KL, Herbert JD. An Open Trial of an Acceptance-Based Behavioral Intervention for Weight Loss. Cognitive and Behavioral Practice. 2009;16(2):223-235. doi:10.1016/j.cbpra.2008.09.005.